 India / United Arab Emirates / USA  2018  80m   Directed by: Maurice Haeems.  Starring: Henry Ian Cusick, Kathleen Quinlan, Erika Ervin, Jenna Harrison, Karishma Ahluwalia, Jennifer Gjulameti, Raviv Haeems, Kaavya Jayaram.  Music by: Aled Roberts. 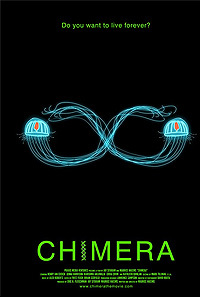 Barricaded in his warehouse-lab, a brilliant but discredited scientist must battle personal demons and forces of evil, as he races against time to save his dying children by unlocking the secret of immortality encoded within the Jellyfish's DNA. This is just one more "Scientist playing God and failing miserably" story. It doesn't matter that the reasons he fails are morally extinct and that the way he handles crisis is to succumb to apparent psychotic strength, because he is a nice scientist that can't do violence. A cliched and ridiculous promise that doesn't really do justice to scientists (or mad scientists for that matter). No person of science would be intimidated by a psycho boss lady and her uber strengthy hench... person. It took three thirds of the movie to reach an obvious conclusions, only to change things as a superfluous twist that no one needed. Bottom line: a movie in which all people acted for the money, rather than for the idea of the film, resulting in a boring, cliched, pointless plot and a sub mediocre performance. Review by siderite from the Internet Movie Database.